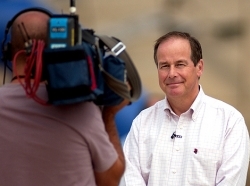 David Passmore is a vastly experienced and award winning BBC Sports presenter and reporter. He is a well-known member of the presentation team which has helped make Points West one of the most watched news programmes in the country. David has reported from many famous locations both across the UK and around the world. He recently presented from the Olympics and Paralympics both in London, and at the sailing in Weymouth. Before the games he travelled to Kenya to meet some of the athletes who would go on to star at the games. http://www.bbc.co.uk/news/uk-england-bristol-18156189. With such a track record in reporting he is an obvious choice for voice over work. He is a popular after dinner speaker, with the ability to host conferences and awards ceremonies. He has considerable experience in media training for reporters, presenters and contributors, including a spell with The South African Broadcasting Corporation and many BBC schemes.